This guide will help you plan your visit to Miami and Miami Beach. Art-Collecting.com created this special events guides to help you schedule and organize your time during Miami Art Week. We hope that you too find it useful. We've included lots of events, including those at art fairs, art museums, private art collections, and commercial galleries. Some of the more exclusive and private events are not included. If you find this guide useful, please tell your art friends about it and encourage them to order a copy for themselves. We hope that you have a wonderful and enjoyable Miami Art Week. 801 Ocean Drive, Miami Beach 33139. Ocean Drive and 12th Street, Miami Beach. 8:00 - 9:00pm weather permitting. 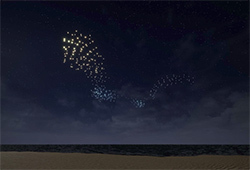 300 illuminated drones will simulate a flock of birds above the ocean and beach. It's a performative artwork at the interface between technology, science, nature and art. A flying sculpture by Studio Drift (Amsterdam) in partnership with BMW. Public event, final time and date will be shared on Instagram @studio.drift. Sagamore Hotel, 1671 Collins Avenue, Miami Beach. 6:30pm - 8:00pm, YOUTshine @ Superfine! A Queer Art Film Series, $20 admission. 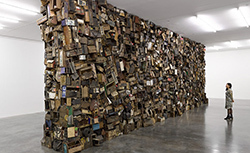 Miami has a number of important collections, both private and public, and they make a special effort to welcome guests during Miami Art Week. Many are hosting special events like opening receptions, lectures, tours and brunches during Art Fair Week. Visit their websites for additional event details. Closed until Spring 2018 for renovations to better serve the community. Opening Reception: Wednesday, December 6th, 7-10pm. If you know of EVENTS RELATED TO MIAMI ART WEEK, please let us know details so we can add them. info@art-collecting.com. No new information will be added to our guides after Saturday, December 2nd. We do our best to provide you with current and accurate information about the art fairs and Miami Art Week. Also, you might want to check directly with the event organizers, art fairs or galleries if you have specific questions about programs or events. Some interesting events are listed below, not in any particular order. Located a few blocks north of Wynwood. The MDD has been growing the past few years and is now considered a must see during Miami Art Week. The Institute of Contemporary Art Miami (ICA Miami) and the de la Cruz Collection are located in this district. You'll find several art galleries and lots of luxury brand fashion and design stores - many of them feature special art displays during Miami Art Week. 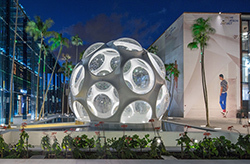 Craig Robins is the driving force behind the growth of Miami Design District and his collection of contemporary art and design can be found here. Look for Buckminster Fuller's Fly's Eye Dome. Click here for a map of the Miami Design District. Studio Drift (Amsterdam), Faena Hotel (Miami Beach), PACE and BMW will premiere FRANCHISE FREEDOM - a flying sculpture by Studio Drift in partnership with BMW. It's a performative artwork at the interface between technology, science, nature and art. An autonomous flying swarm of 300 drones. Public viewings 7-10pm, December 6th, 8-9pm weather permitting. Final time and date will be shared on Instagram @studio.drift, Location: Faena Hotel Miami Beach (just off Collins Avenue between 32nd and 33rd Streets). 300 illuminated drones will simulate a flock of birds above the ocean and beach. Additional Info from Studio Drift. 2520 NW 2nd Avenue, Miami, FL 33127. This year's theme for the Wynwood Walls, "humanKIND," aims to "manifest hope into the world." To inspire action, Goldman Properties CEO Jessica Goldman Srebnick curated the 12 artists that are presented this year: Seth Globepainter (France), Joe Iurato (USA), Leon Keer (Amsterdam), Tristan Eaton (USA), Lady Pink (USA), eL Seed (France), 2SHY (France), Audrey Kawasaki (USA), Bordalo II (Portugal), Pro176 (France), Risk (USA) and Martin Watson (Norway). The artists will also be featured in the on-site gallery. The walls will be open to the public from Thursday, December 7th, 10:00am to midnight daily, through Sunday, December 10th. A good way to visit art fairs is to obtain a VIP pass. This allows you first access to the exhibitors and the best chance to purchase artworks from galleries. Here're some links to sign up for VIP Passes, sign up today, because many of the art fairs stop issuing passes before December. Not every art fairs is listed below because it's too late to apply for some. Complementary day passes are sometime available from participating galleries, We've seen these offered by Context, Art Miami, Untitled and Pulse Miami galleries.